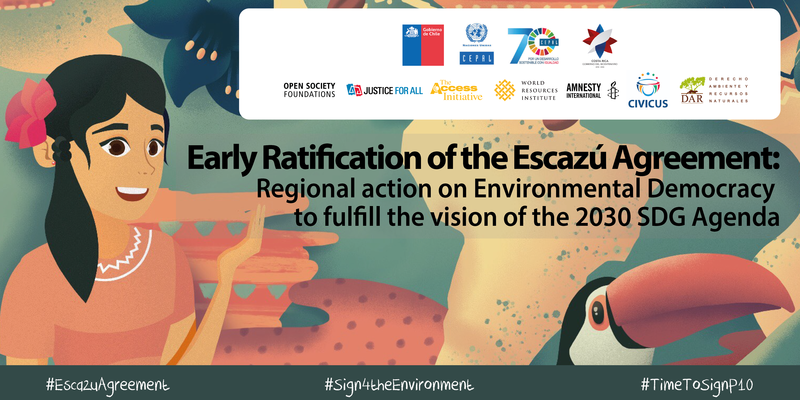 Building on the signing of the Escazú Agreement in Costa Rica on March 4, 2018, WRI will host an event to encourage additional countries to sign and ratify the Agreement — a vital international treaty that guarantees protections of the environment and the strengthening of human rights for environmental defenders. Regional Action on Environmental Democracy to Fulfill the Vision of the 2030 Sustainable Development Goals Agenda is intended to enable dialogue and inspire countries to sign and ratify the Escazú Agreement, a historic binding treaty on environmental democracy for countries in Latin America and the Caribbean, emphasizing the rights of vulnerable people and environmental defenders. The Agreement opens for signatures on the 73rd session of the United Nations General Assembly. It is imperative that 33 governments in Latin America and the Caribbean sign this treaty and ensure comprehensive protection of the environment and the people who work to defend it. The Agreement establishes a more transparent, fair, participatory and equitable decision-making process for activities that impact the environment. This multi-stakeholder, international event draws stakeholders from governments, civil society, and the environmental community. It will focus on the only legally binding agreement from Rio+20, which puts Principle 10 into practice, and ways it can be implemented regionally. WRI is the secretariat for The Access Initiative, a civil society network focused on achieving environmental democracy worldwide. WRI and The Access Initiative have played an instrumental role in coordinating and supporting this historic agreement. The event is co-sponsored by The Access Initiative, Amnesty International, Civicus, Derecho Ambiente Recursos Naturales, Namati, Open Society Foundation, and World Resources Institute.